We started bringing some cracked corn for the geese this winter. It seemed a nice thing to do. 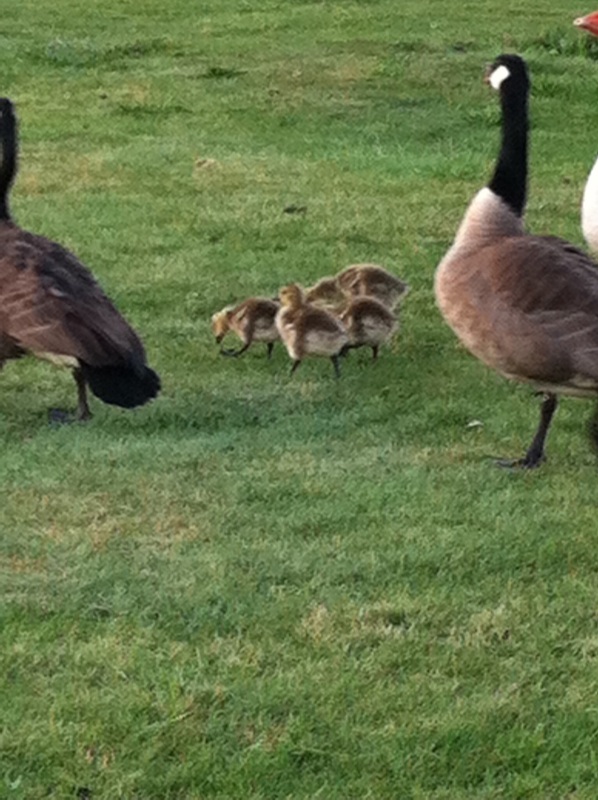 There are 12 domestic geese, lots of little ones and the migratory Canadian geese. But it’s been fun to see them wait for us in the morning. Except this morning there was a jogger, a very grumpy jogger who yelled at me “did I feed the geese”, yes, well he says “they almost bit me as I went by” i said yeah they have babies go around them. He then used a number of explicatives saying he was going to grab one of the geese and smash it to the ground. Oh… Okay, nice… So his point was feed the geese away from the path. Okay, but you just need to go around them anytime they’re on the path because the mother geese will hiss and probably bite if you are too close. Well, tomorrow I will feed the geese away from the path. Geez, talk about a nasty encounter. Well, that’s the talk from the walk this morning!